We take counsel from the ancient preacher that there is a time for everything, “a time to keep silence and a time to speak” (Ecclesiastes chapter 3 verse 7). A manifestation of such extremism is the extent to which fringe groups within our midst would go to advance their racism and religious bigotry over the controversy of the use of the word ‘Allah’ to refer to God by non-Muslims. They have even suggested an open season for burning Bibles (pesta membakar Alkitab). Nothing can be more seditious and incendiary. Yet they were tolerated by the authorities. Let us be clear that the ‘Allah’ controversy is more than just about a word. Indeed, various States have passed legislation prohibiting more than three dozen words from being used by non-Muslims. This legislation is applicable and is indeed expressly directed at non-Muslims. For instance, a fatwa which has the force of law was gazetted on 1 June 2003 in Sabah under the Enakmen Pentadbiran Undang-Undang Islam 1992 whereby the use of 32 words is prohibited to non-Muslims. These included “Allah” (God), “Ibadah” (Worship), “Iman” (Faith), “Rasul” (Apostle), “Injil” (Gospel), “Nabi” (Prophet], “Wahyu” (Revelation) and much more. This is done notwithstanding that Islamic syariah law do not apply to non-Muslims. The first of such state legislation was introduced by the Terengganu state government in 1980. The following year, the use of the Alkitab or the Malay language bible was prohibited on grounds that it is a threat to national security. The ban has since been modified to a restriction but the Alkitab is still considered a threat to national security. In December 1986 the Ministry of Home Affairs issued a circular prohibiting the use of the word Allah’ on the purported grounds that such action was necessary for the purpose of maintaining public order and to avoid misunderstanding between followers of Muslims and Christians. This administrative decision was enforced using the draconian Printing Presses and Publications Act 1984. In 2003, the Bup Kudus or the Iban language Bible was banned as it contains the word ‘Allah’. The ban was subsequently lifted following protests by Christians. In Sarawak and Sabah, the word ‘Allah’ has been used or spoken by the native communities of the state for generations and long before the formation of Malaysia and is part of their native language. Native Bumiputeras have always been using the term “Allah” in all aspects of the profession and practice of their Christian faith from baptism to final rites and these include in services, prayers, praise, liturgy, worship, and religious education. The term “Allah” is also used in Christian publications and multi-media resources. The right of the native Bumiputeras to use or speak their own language and to practice their religion in the state is safeguarded by the Federal Constitution. The ‘Allah’ controversy is not really about religion as such but about unreasonable government policies and laws. In the face of such unreasonableness we cannot and should not remain silent. The time for us to speak has come. Two thirds of the Church in Malaysia is made up of Bumiputera Christians in Sabah and Sarawak. In this respect, we speak with pastoral and moral responsibility and authority against religious bigotry, racism and extremism in any form. But we are not alone as our non-Bumiputera brothers and sisters in Christ have also expressed similar concern over the ‘Allah’ issue on other occasions. We, therefore, speak as one voice. We need more than just a display ad hoc benevolence. We need a tangible commitment from the authorities to respect and uphold the freedom of religion guaranteed by the Federal Constitution – the supreme law of the nation. We believe non-Christians, including Muslims, also share our concern. There is an urgent need for the authorities to acknowledge our frustration and to commit to come up with a long term solution. KUALA LUMPUR, May 3 — The “Allah” controversy is not about religion, but about “unreasonable government policies and laws”, Sabah and Sarawak churches said today ahead of polling day on Sunday. The Bumiputera churches in Sabah and Sarawak released a pastoral communique yesterday that called on Christians to speak up amid threats to burn their holy scriptures and government policies that prevent the minority group from referring to their God as “Allah”. “In the face of such unreasonableness, we cannot and should not remain silent,” said the Anglican Bishop of Kuching and Association of Churches in Sarawak chairman Rev Datuk Bolly Lapok in the communique. “The time for us to speak has come…We need a tangible commitment from the authorities to respect and uphold the freedom of religion guaranteed by the Federal Constitution – the supreme law of the nation. We believe non-Christians, including Muslims, also share our concern,” said Lapok, who is also the Archbishop of the Anglican Province of Southeast Asia. ACS’ strongly-worded statement comes just two days before the country’s closest election in history, where a sizeable chunk of voters in Sabah and Sarawak are Bumiputera Christians who read the Alkitab, or Malay-language bibles. The Christian community forms about a quarter of Sabah’s population and almost half of Sarawak’s population, where they mainly worship in Bahasa Malaysia church services. An anti-Christian billboard is pictured at an undisclosed location. KUALA LUMPUR, May 1 ― Pictures of provocative election campaign billboards painting churches as usurpers of “Allah” have spread online and sparked a storm among Christians as political parties and their supporters appear to pull out all stops in their desperate sprint for Putrajaya with polls four days away. The Christian Federation of Malaysia (CFM) issued a strongly-worded statement today recording their outrage at what they call a “despicable and heinous” anti-Christian message on election campaign boards and demanded the Election Commission act swiftly to douse the sparks of such religious fear-mongering from catching fire once more. “These fears are real given the recent history of Church burnings and threats to burn the Bible in Bahasa Malaysia. “The message pits one community (Muslims) against Christians by spreading fear through scare tactics using the issue of ‘Allah’ which the High Court had allowed as a right to freedom of religion,” said Rev Eu Hong Seng, chairman of CFM, and its executive committee. 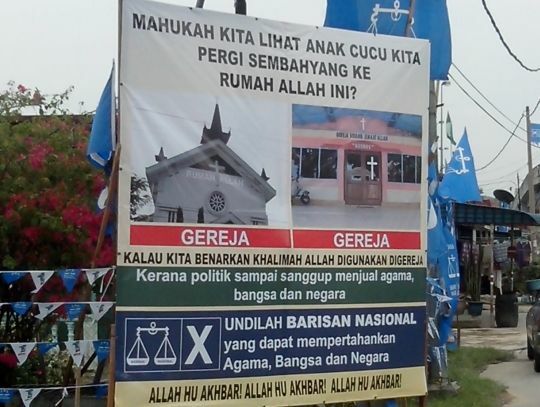 Alongside the statement, the umbrella body representing 90 per cent of churches nationwide sent pictures of two billboards with the message asking in Malay: “Do you want to see your grandchildren praying in Allah’s house” and lower down the boards, “If we allow Allah to be used by churches”. Pictures of churches were pasted on the billboards. In 1981, the Alkitab or the Malay language Bible on grounds that it is a threat to national security. The ban has since been modified to a restricted ban but the Alkitab is still considered a threat to national security. Perkasa president Ibrahim Ali is seeking re-election as Pasir Mas MP in Kelantan as an Umno-friendly candidate against PAS. The Umno candidate has withdrawn by not submitting his nomination papers to make way for Ibrahim. Former Prime Minister Dr Mahathir Mohamad is not only patron of Perkasa but it was he who suggested that Ibrahim be fielded as an Umno/Barisan candidate in this general elections. Perkasa’s vice president, Zulkifli Noordin, has moved from his Kulim Bandar Baru MP seat in the north to challenge Khalid Samad of PAS in Shah Alam, Selangor, on the Umno/Barisan ticket. Like Ibrahim, he was previously elected on the opposition ticket but later crossed over to be Barisan-friendly independent MP. KUALA LUMPUR, April 26 — Datuk Seri Najib Razak has expressed support for the appeal to overturn a High Court ruling which allows the use of the Arabic term “Allah” for God by non-Muslim groups in Malaysia, according to an interview with global news station Al Jazeera. The caretaker prime minister also told Al Jazeera English’s Veronica Pedrosa in the interview, to be aired tomorrow, that he did not intend to have a public election debate with Opposition Leader Datuk Seri Anwar Ibrahim before the May 5 polls. “The concept of Allah is different in the Muslim sense than in the Christian sense, we should not upset the Muslims and Muslims should not upset the Christians, we are living in harmony for years and it should continue,” he was quoted as saying in an excerpt distributed by Al Jazeera English. The Court of Appeal has fixed May 30 for another case management on the government and Home Ministry’s appeal against the 2009 High Court decision that the word “Allah” can be used by the Catholic weekly newspaper Herald. KUALA LUMPUR, April 26 — Christians will vote against corruption and social injustice in Election 2013, besides calling for religious freedom in multi-racial Malaysia, church leaders said today. They also said that Datuk Seri Najib Razak’s support for the appeal to reverse a High Court ruling allowing Christians to use the Arabic word “Allah” contradicted his 2011 resolution granting east Malaysian Christians the freedom to do so. “The question that begs to be answered is whether the 10-point solution decided by him and the Cabinet is still valid?” Christian Federation of Malaysia (CFM) chairman Rev Dr Eu Hong Seng told The Malaysian Insider today, referring to the caretaker prime minister. “Before the GE, the Church is looking at a broad spectrum of issues — corruption, improvement to the economic well-being of people, freedom of religion, men of integrity to be our future MPs. I think Christians at large in Malaysia, whether east or west, we share the same strong sentiments about corruption,” added the head of the ecumenical umbrella body that represents 90 per cent of Malaysia’s roughly two million Christians. Prayer United is a prayer network which consists of nine Christian fellowships. The National Envangelical Christian Fellowship (NECF) – which is also a part of the prayer network – has produced a booklet to guide its followers in their vote. The Council of Churches of Malaysia (CCM) – in collaboration with the Catholic Research Centre – has produced a video, which Chin said has gone “viral” on Youtube and Facebook to help Christians in deciding who to vote for. BIBLE BURNING: Alarming, to say the least. Explosive, it could become! Being Christian in Malaysia: ALWAYS Under Attack! CFM Letter to the Malaysian Churches and Christians on the forthcoming 13th GE. File photo of Christians at a service in a Catholic church in Petaling Jaya. Christians have been encouraged to pray for the general election. KUALA LUMPUR, April 6 — Churches have joined in the drive to educate voters, urging Christians to come out and vote with wisdom in Election 2013, which is expected to be Malaysia’s most intense polls. In a video uploaded on YouTube yesterday, Christians were reminded of their moral duty to vote. “We vote because we have a moral obligation to participate in the life of the nation,” said a narration in the video jointly produced by the Council of Churches Malaysia (CCM) — an umbrella body of Protestant churches — and the Catholic Research Centre. In the video, Christian voters are asked to vote for a corruption-free country where all Malaysians are treated as equals and there is religious freedom, among other things. But voters are warned against relying on a single source of information in deciding on their candidates. 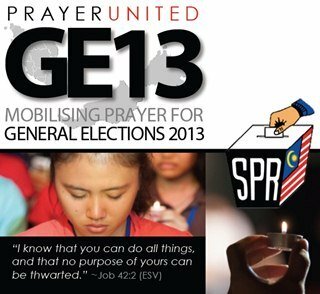 REMINDER….. CFM LETTER TO THE MALAYSIAN CHURCHES & CHRISTIANS ON THE FORTHCOMING 13thGENERAL ELECTIONS. PLEASE PASS IT ON TO OTHER MALAYSIAN CHRISTIANS YOU KNOW. VOTE WISELY, VOTE FOR A BETTER MALAYSIA. The Christian Federation of Malaysia (CFM) therefore invites and encourages all Christians to be conscious of their political rights – to vote, and to use the power of the vote to elect a government that will ensure justice with equity and the well-being of our nation. The CFM is not politically motivated nor is it endorsing any one political party. It is of fundamental importance in a democracy, that citizens actually exercise their right to vote. Having the right to vote without utilising it is of little use. A nation where language and education are de-linked from political expedience. A nation where elitism and inequality is not rampant and people are recognised and respected as human beings and not discriminated against due to social position, educational attainment, political beliefs, gender, race or religion. The Christian Federation of Malaysia (CFM) is an ecumenical umbrella body in Malaysia that comprises the Council of Churches of Malaysia (mainline Protestants and Oriental Orthodox), National Evangelical Christian Fellowship (Evangelicals) and the Catholic Bishops’ Conference of Malaysia (Roman Catholic). Formed in 1985, the CFM brought together the major expressions of Christianity in Malaysia in a broad-based ecumenical body and a unified voice in dealing with the government as well as other religious and secular bodies in the country. This entry was posted in Uncategorized and tagged (mainline Protestants and Oriental Orthodox), al Kitab, Allah, Bishop Ng Yoon Moon, CFM Letter to the Malaysian Churches and Christians on the forthcoming 13th GE., Christian Federation of Malaysia, christianity, church, churches against corruption, corruption, Council of churches of Malaysia, GE 13, justice, malaysia, National Evangelical Christian Fellowship (Evangelicals), politics, religion, the Catholic Bishops' Conference of Malaysia (Roman Catholic).. Bookmark the permalink. You pray for peace yet you do not repay the debts you owe to other people and their families arising from your deceitful and scheming ways. Don’t hide behind Christianity and the Church. Your salvation is to clear your debts and apologize to your victims first before trying to deceive the rest of the world. Did you just make a personal attack? No. Just to highlight BERSIH people in BERSIH organizations should be fighting for BERSIH causes.